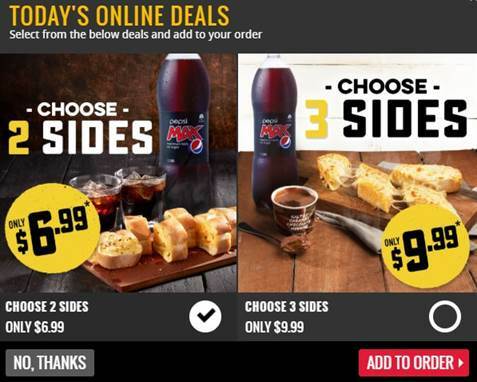 MoneyHub lists the latest Domino's coupons, voucher codes, promotions and deals for Domino's stores New Zealand wide and for use on dominos.co.nz. No voucher needed. Available at participating stores only. Check your local Domino's store by entering your postcode to see the latest promotions. Our coupon codes above can be better than the local listings. 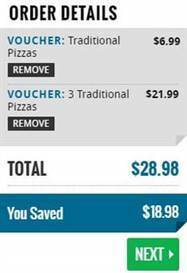 There are always ways to save money when ordering a pizza. Even if there isn't a deal above that works for you, there are other ways to save on a pizza takeaway. 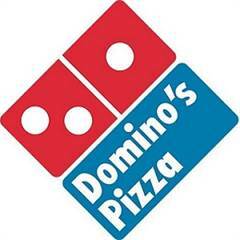 HIGHLY RECOMMENDED - Download the Domino's Offers App. This is absolutely recommended, making it easy to swipe through the latest offers available from your local store. HIGHLY RECOMMENDED - Sign up to the VIP Club email and SMS offers. You'll receive details of store-specific promotions directly to your phone and inbox. Follow Domino’s on Facebook. You’ll then receive news of pizza promotions, voucher and coupon codes as well as exclusive deals. Check out Pizza Hut instead. If you’re willing to order with Pizza Hut instead, check out our Pizza Hut page, where you may find a better pizza deal. Know something about Domino's coupons we don't? Want to share it with thousands of New Zealanders? Email our coupon team now and share the love.